Whenever complete an assignment given to you, it is very important to check and verify the level to which the assignment was done properly. Same goes to trial balance. When the accountant posts ledger account through journal during the accounting period it needs to be verified. The trial balance as an important tool to check the arithmetical accuracy of posting of ledger accounts. This means that the trial balance is used to verify actual amount entered in correct side of current account while moving the figures from various ledger books like purchase day book, sales day book, cash book, etc. Trial Balance aside from general ledger accounts is used for checking the accuracy of special purpose accounting books. Financial statements like Profit and Loss Account, Balance Sheet and Cash Flow Statement needs to be prepared at the end of every accounting year. The balances of all the ledger accounts used to prepare financial statements are already available in the trial balance and hence, preparing and analysing of financial statement becomes easier. Since the debit total of trial balance must equal to credit total of trial balance, this checks the arithmetical accuracy of ledger postings. If it is not balanced, it will make accountant to find and rectify the error. After preparing the trial balance, accountants feel relieved when the trial balance debit totals and credit totals match. Adjustment accounts like prepaid expenses, outstanding liabilities, closing stock, etc needs to be prepared during preparation of trial balance. This assists in making adjustments only relevant to current accounting year. Businesses prepare adjustment accounts generally at the end of accounting year. However, there is no restriction to open these adjustment accounts as they occur. The trial Balance helps to compare balances of the current year with past year balances along with peer analysis. This will help the business to take important decisions concerning income, expenses, production costs, etc. It helps to recognize the trend in the business and take actions wherever necessary. Trial Balance helps the auditors to locate the entries in the original books of accounts. Basically, audit trail is what auditors need to audit and this is what trial balance provides. Auditors are then able to comment on preparation of financial statements in their audit report. 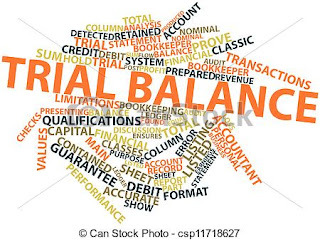 As we have seen above trial balance helps in comparison of ledger balances with the past balances. Such comparison helps the management to create trend regarding performance of the business. After analyzing the comparisons, financial budget can be prepared for the upcoming accounting periods to assist the management.